Here you’ll find a list of online forums & message boards dedicated to small trailers. Sierra-Scotty Yahoo Group: For those interested in Sierra Motor Corp’s Campfire & Bak-Pak campers as well as Serro Scotty Worldwide trailers built from 2007-present. T@B & T@DA Yahoo Group: The definitive source for anything related to T@B and T@DA trailers. Casita Travel Trailer Forum: Good source for info on Casita trailers. Teardrops & Tiny Travel Trailers Forum: A GREAT site for info on teardrops & other smaller trailers. FiberglassRV.com Comprehensive forum covering just about every fiberglass trailer known to man! Hi-Lo Trailers Yahoo Group: This group is for the discussion of HiLo Classic, TowLite, FunLite, and other Hi-Lo travel trailers. Lightweight Camper Forum: Forum for owners of lightweight travel trailers. r-pod Nation Forum: Over 1300 members strong! Oliver Trailers: One of the best fiberglass trailers is back! How about a group for HiLo Trailers? Will the new Scotty Hi-Lander stay true to its original design? One of the best features is the raised refrigerator. Much better than having to bend over to retreive a cold beer on a hot summer day. Another great feature is the choice between a dinette or full size mattress. Since it features a front dinette, for 2, a rear dinette is not so important. Please advise of your findings and keep us up to date on new Hi-Lander’s progress. Keep up the good work. Yours is an excellent blog. There are two forums dedicated to the R-Pod, would be nice to see them linked/posted. Love the blog and info you provide, thanks. After years of tent camping, we are stepping up to a towable trailer and are considering. Winnebago Minnie 1801. Does anyone have any experience with this cute little gem? We would appreciate any feedback! 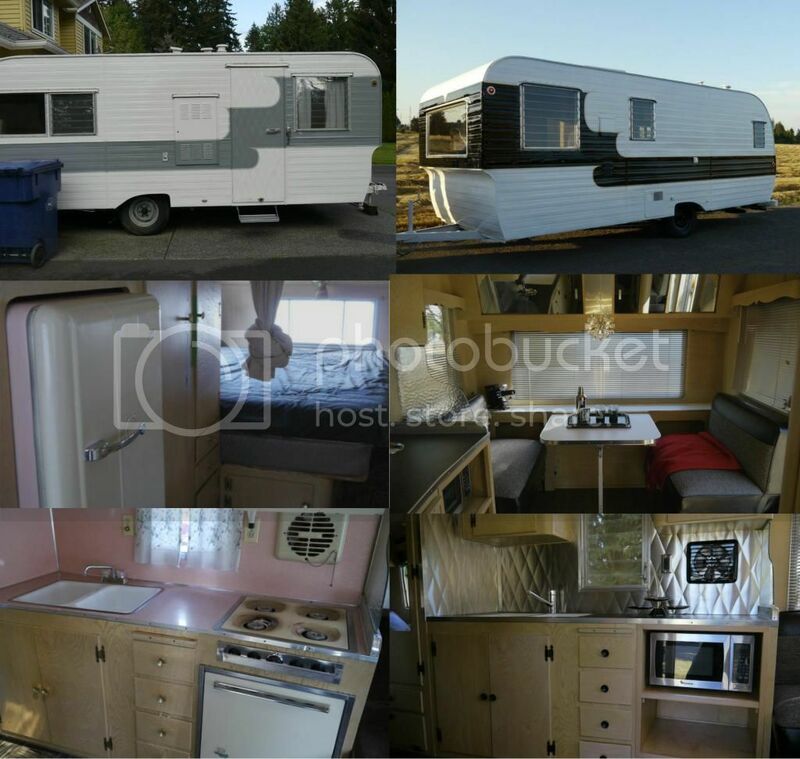 Hi, do you have any ideas on buying a used travel trailer? Are any brands that hold up better than others, any good websites…? Thank you – I love your site. I would suggest you to contact “Charles Lawhon’s trailer world offer all types of trailers and truck accessories like cargo trailers, utility trailers, rental trailers in Fort Worth TX “as they have sub-contractors and contracts throughout America and Canada. Watch Justin and Anna from Flyte Camp Vintage Trailer Restorations hunt for and restore vintage trailers rescued for clients throughout the country. Hi we have been looking at the new Meercat from San Diego little guy. It is cute and lightweight 900lb. Has anyone had experience with one or heard any pros or cons. Hope to hear feed back. No worries. In the section under teardrops, I’ll put your business name with a link to your site and then I’ll put (Canada) off to the side. Hi Kellie I know how you feel. I just purchased a Aliner Cabin A with a rear tip out bed and is 8ft wide and 12ft long unopened. I can not find a picture or article about it anywhere. I really like the trailer even if the inside finish isn’t so great. It only weighs 1500 pounds and the door is in front of the wheel. I have everybody comment on it and really like it. I can’t believe there isn’t a picture or article about it out there on the internet. I have a 1980’s sunline camper I’m trying to get it down to the aluminum look of an air stream. Aircraft stripper and another 2minute stripper won’t take the primer off 100% any suggestions? Thanks. I am looking a for good online or other source to shop for a good used small trailer. The one’s I have seen are few and far between and seem to be really expensive. I live in the Seattle Tacoma area. Looking for a Scamp or Calista. I really can’t drive cross country to pick one up and it costs 2500-3000 to have it delivered. With their popularity why aren’t here any dealers in the NW. I have a question for you all” I am going to purchase my first and last pickup truck, to be used for tent camping now, eventually to be used to pull a small, hard shell trailer all over North America. The truck I’m looking at is a Toyota Tacoma. In your opinions, 1) is there a reason to get a double cab, or is the access cab adequate. It’ll be just me and my dog, occasionally maybe a friend, too. And 2) should I get a 4 wheel drive option? I don’t think I’ll do any off roading, but I plan to camp in every national park in the US and Canada. Dream big, right? 4 wheel or 2 wheel? Ok friends, what is the best under 20′ Bunkhouse trailer. I am leaning toward the Shasta Oasis 18 BH at this time, seems to be best value/bang for the buck for our family with 2 young children. Fortunately for you, your friendly Small Trailer Enthusiast host has the very Shasta Oasis 18BH. Quite pleased with ours, and it does offer the best bang for the buck in this widely produced floorplan. It offers storage that no other manufacturer offers in this floorplan in both the bathroom and the two cubbies at the end of each bunk. Whatever manufacturer you go with make sure you go with one that offers it in 8′ wide, which Shasta is one. Those who build it 7′ wide to cut down on weight take that extra foot out of the width of the dinette, making it impossible for a family of four to all sit in the dinette. Where are you located? Great to hear, thanks for the reply! I thought I had read about the Oasis in this site. Thanks for the thoughts on the 8′ wide, that is definitely a difference, as I have seen a few that have a tiny dinnette and wondered why. We live in Oklahoma City and are looking to buy in next six months. Any major dislikes with the Oasis? I have a Jeep Wrangler Unlimited (4 door, automatic trans). Anyone have a trailer that works with it? I’m interested in the Cricket right now. Eurekacampersinc.com. Should work great, max weight of their campers Is 1800 lbs. Why is it that these trailers are so heavy when the average towing capacity of of most medium size vehicles is around 2000 lbs. European models are much lighter and better designed. I am a musician who would like a lightweight travel trailer that can be pulled by a gas efficient vehicle. This would make it possible to live on the road and travel our beautiful country. Come on America. We are the greatest innovators in the world. I challenge manufacturers to build a strong, well designed lightweight camper. Looking into buying a Vistabule or a Camp Inn. First time camper and wondering why there are no Vistabule or Camp Inn forums. I see T@G is a fairly new name in the magnificent world of teardrop trailers. How about a forum dedicated to T@G since they are so different from Little Guy and T@B trailers? Is that a possibility? I came across the Wolf Pup new floor plan , the 15sw and on paper have decided that it would be ideal for me and my wife. How is the quality build on the wolf pup line? Is there any issues that’s common among the line? William – Of the entry level “stick & tin” trailers on the market, I’d put Cherokee’s Wolf Pup near the top of the list. The Cherokee brand as a whole has been making cuts into Jayco’s stranglehold on the market’s number 1 selling trailer. If you know you’re buying entry level, buy with confidence. Has anyone pulled a 2018 micro minnie 2106 with a chevy tahoe and what are your thoughts did it pull good??? I have a pop-up camper trailer with 13″ 4-on-4 wheels and 5.30-12 tires. However, the spare that came with it is a 14″ 4-on-4 rim with A78-13ST tires. Will this work as a spare, or is it too big? Seems like the trailer would be going down the road at a tilt. For safety’s sake, I’d want all my tire sizes to match up.